Francesco Vitale at Nauta Yachts calls to say that he's brought the 29.1m motor yacht Atlantica Atlantica back to the market. Built by Sanlorenzo in 2006 to RINA class, she has an interior in American elm wood accommodating eight guests in a main deck master suite while below there is a VIP stateroom and two double cabins. Her large flybridge has direct access from the wheelhouse and features sunbathing areas, a Jacuzzi and a hard top. Twin 2,190hp MTU engines give Atlantica Atlantica a cruising speed of 23 knots. 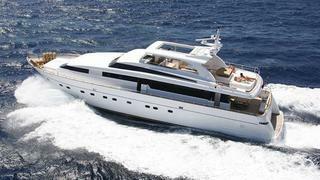 Lying in Athens, Atlantica Atlantica is asking €3.35 million.